Foreign accounts of Muscovy have long been recognized as fundamental historical sources. Generally speaking, they relate two kinds of evidence for those interested in early modern affairs. First, the accounts provide ample information about Muscovite society itself. Works such as Herberstein's seminal Rerum moscoviticarum (Vienna, 1549) offer modern historians rich data about Muscovite social, cultural, political, and military practices. The importance of foreign Muscovitica is heightened by the fact that similar information is almost completely unavailable in indigenous Old Russian sources. A second sort of evidence available in the foreign accounts concerns not Muscovy per se, but the way the image of Muscovy was constructed in the writing of outlanders. Those describing Russian affairs did not come to the task tabula rasa. A host of factors outside Muscovite reality shaped their views: foreigners were often ignorant of Russian and Russian affairs; they saw only parts of Muscovite society, and in some cases never saw it at all; they were sometimes moved by cultural, religious, or political prejudices; they frequently "borrowed" outdated and inaccurate material from their predecessors, and they wrote in specific genres which defined the topics proper to their purpose, while excluding others. In short, the foreigners' accounts provide us with as much information about the history of European mentalities as about Muscovite history proper. Despite the importance of foreign Muscovitica, the bibliographic tools available to scholars wishing to use the foreign accounts are quite deficient. The fundamental source of bibliographic information about foreign writings on Muscovy is Friedrich von Adelung's century-old KritischLiterarische Ubersicht der Reisenden in Russland bis 1700 (2 vols. ; St. Petersburg, 1864). Adelung's chronological list of accounts is found wanting in several ways: it is very incomplete (much new foreign Muscovitica has been uncovered since Adelung wrote); it is frequently inaccurate and misleading (the book contains many incorrect attributions, dates, names, titles, and other miscellaneous errors); it does not distinguish different types of foreign accounts in terms of their generic character (Adelung divided all texts into compendia and self-standing documents); it contains no systematic indication of "borrowing" (thus scholars are unable to distinguish genuine material from those plagiarized); finally, Adelung's book provides no description of modern publications of foreign accounts or the secondary treatments of them. Foreign Descriptions of Muscovy is intended to address all of these difficulties and thereby to advance research using the foreign accounts. The bibliography describes a particular strain in the universe of foreign writings on Muscovy -- "state-descriptive discourse." State-descriptive discourse was a discrete, early modern, cultural arena comprised of several different genres: the state-descriptive monograph (works offering synoptic views of states), the cosmography or compendium (works printing several reduced synoptic views under one cover), the narrative relation ("news" or "historical" works offering narrative information about states), and the theoretical treatise (works generalizing state-descriptive information for "scientific" purposes). State-descriptive information had several distinctive features. Most important, it was putatively non-fiction; authors writing in this vein understood themselves to be describing, not inventing (though in fact they did much of the latter). It was by and large public: state-descriptive information was not generally part of personal correspondence, though there are exceptions, particularly in the earliest period of the discourse. Finally, state-description was "political" in a particular sense: the object of discussion is almost always the structure of states and societies, resources of rule, and the activities of the powerful. The bibliography is divided into two major sections. The first is a bibliography of secondary literature concerning state-description generally and Muscovite state-description in particular. 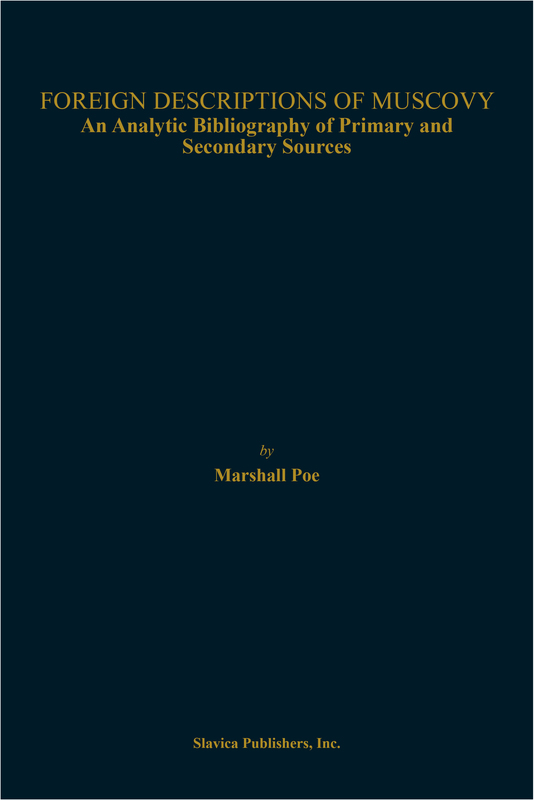 It is divided into three sub-sections: 1) major bibliographic resources for the study of early modern "travel literature" and foreign accounts of Muscovy; 2) a nearly exhaustive bibliography of studies which use foreign accounts of Muscovy as positive evidence for Russian history or as evidence of Western Ruslandbilden; 3) finally, a bibliography of works useful in contextualizing foreign accounts of Muscovy. The second section offers a new, and significantly expanded, chronological list of foreign accounts of Muscovy, 1450-1700. Well over 600 foreign accounts of Muscovy are described, more than half of which are not listed in Adelung's bibliography. Each entry includes: the author's name, vital dates, nationality, and occupation; full title of first edition; the date of writing; the date of first and subsequent early modern printings (if published); information on possible "borrowing"; generic type; modern editions and translations; important studies of the work and its author.